What are the major types of connective tissue and their function? The major types of connective tissue are: 1) loose connective tissue; 2) adipose tissue; 3) blood; 4) collagen, sometimes called fibrous or dense connective tissue; 5) cartilage; and 6) bone. Loose connective tissue, also called areolar tissue (from the Latin areola, meaning “open place”), is a mass of widely scattered cells whose matrix is a loose weave of fibers. Many of the fibers are strong protein fibers called collagen. Loose connective tissue is found beneath the skin and between organs. It is a binding and packing material whose main purpose is to provide support to hold other tissues and organs in place. Adipose tissue consists of adipose cells in loose connective tissue. Each adipose cell stores a large droplet of fat that swells when fat is stored and shrinks when fat is used to provide energy. Adipose tissue provides padding, absorbs shocks, and insulates the body to slow heat loss. Blood is a loose connective tissue whose matrix is a liquid called plasma. Blood consists of red blood cells (erythrocytes), white blood cells (leukocytes), and platelets (thrombocytes), which are tiny pieces of bone marrow cell. Plasma also contains water, salts, sugars, lipids, and amino acids. Blood is approximately 55 percent plasma and 45 percent formed elements. Blood transports substances from one part of the body to another and plays an important role in the immune system. Collagen (from the Greek kola, meaning “glue,” and genos, meaning “descent”) is a dense connective tissue, also known as fibrous connective tissue. 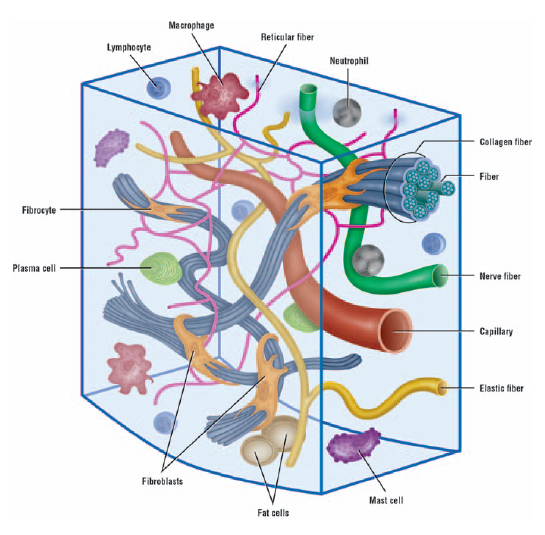 It has a matrix of densely packed collagen fibers. There are two types of collagen: regular and irregular. The collagen fibers of regular dense connective tissue are lined up in parallel. Tendons, which bind muscle to bone, and ligaments, which join bones together, are examples of dense regular connective tissue. The strong covering of various organs, such as kidneys and muscle, is dense irregular connective tissue. Cartilage (from the Latin, meaning “gristle”) is a connective tissue with an abundant number of collagen fibers in a rubbery matrix. It is both strong and flexible. Cartilage provides support and cushioning. It is found between the discs of the vertebrae in the spine, surrounding the ends of joints such as knees, and in the nose and ears. Bone is a rigid connective tissue that has a matrix of collagen fibers embedded in calcium salts. It is the hardest tissue in the body, although it is not brittle. Most of the skeletal system is comprised of bone, which provides support for muscle attachment and protects the internal organs.